The Radars I worked on in the army were putting out peak power at 5 megawatts, but because it was listening most of the time, the average power was “only” 5 kilowatts, still equal to several microwave ovens. But it had to illuminate a huge slice of the sky. In contrast the microwave sets that my roommates trained on were putting out only a few hundred milliwatts to a few tens of watts, depending on the distance. I put my finger in the horn of a radar training set putting out 1 watt, and I could just barely tell it was warmer than the ambient temperature. It used a reflex klystron tube similar to those used in a microwave radio for the telephone equipment. The reason they can go so far with so little power is because the dish antenna has huge gain, thousands of times, and the beam is directed at a small spot on the horizon. I would guesstimate that the radio sets for these antennas were putting out less than a hundred watts, which would take a long time to cook a chicken. One never knows what secrets the US government has hidden. They could have some other plans for using the WWV stations. “I found it incredibly chilling to be there. The plant itself is very strange. You don’t smell or see or touch radiation, so you don’t know. But [there’s] this whole process of getting completely suited up, and there are literally thousands of workers there, and they have to dress like that every day. I think they’re only allowed to work there for about a month at a time before they’ve been exposed for too long; it’s too dangerous. It’s almost like slave labor. It’s all men, and now, more and more, much older men who have decided, “Well, I’m not long for this world. I guess I’ll just work at cleaning up Fukushima.” And it’s going to take maybe 80 years to clean it up. I used the free Android app ElectroDroid to do these calculations. 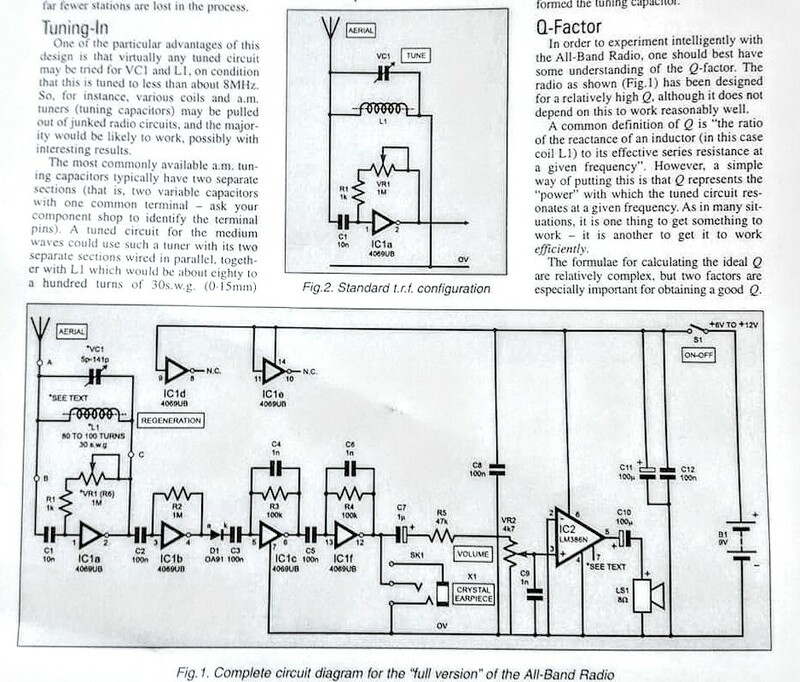 For 702 kHz, a 220 pF fixed capacitor (NP0 or C0G) and a 230 microhenrys coil are needed. The standard ferrite loopstick is 230 uH, but you can wind your own on a coil form such as a toilet paper roll. For a TP roll 44 mm diameter and coil 70 mm length, it takes 92 turns. But beginning at the 85th turn you make a tap every 2-1/8 turns, up to about 100 turns. Then you can connect the capacitor to one of the taps to tune the circuit to the right frequency. Any recommendation for doing a complete alignment? Documents? I used a HP sweep gen decades ago but I don’t have one now, just an old signal gen. I thought about building a sweep gen but I need to get a few parts. I have bought a few radios on eBay and when the caps started going bad and volume got weak, the owner diddled with the IFs, not realizing it wouldn’t help, only make it worse. So the only thing I’ve seen have been simple instructions in the Sam’s schematics. Yeah, I used to use the Sylvania ECG and the NTE catalogs to cross-reference transistors. But then I got some better product manuals from the makers, especially Motorola and National Semi. And I got hold of the professional industry documents. ECG and NTE give a ‘one size fits all’ cross-reference, and that’s just too iffy for a good substitute. from FB group Building Transistor Radios post by Tuck Choy. I sharpened and lightened it to make it more readable. From EPE Mag. Sep 2005 by Thomas Scarborough. Since only four of the 6 inverters of the CD4069 are used, the CD4001 or CD4011 quadruple NOR or NAND gates should substitute, if the other unused gate is grounded or tied to positive. I have a few CD4049 hex inverters, I should try one of those and see if it will work. Update Mar 13 – Tuck Choy posted the complete article as a .PDF file.